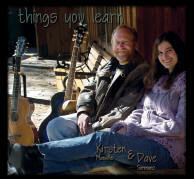 Kirsten & Dave's debut CD, dreams that just won't let go, was released in October 2006. Come to one of our gigs and buy them directly from us. Please specify which album you want! OR buy them at iTunes.